Mercy and healing extended to the oppressed and outsiders was never a popular concept in Jesus’ day. In today’s Gospel (Luke 4:21-30), we see the people of the synagogue becoming so threatened by the power of Jesus to free, cleanse and heal the outsiders that they were ready to “hurl him off the cliff”. 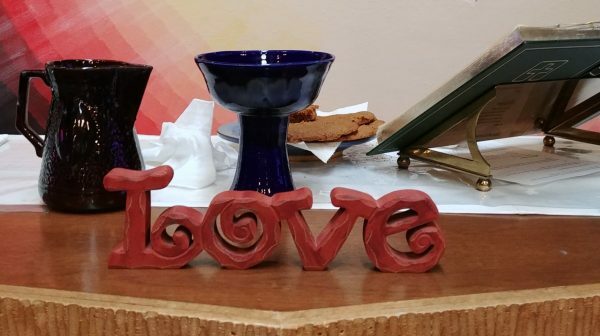 Pastor Beth’s sermon illustrated both the vulnerability and the power of love. Jesus was ostracized for his attention to the poor and disadvantaged, but he continued to do great things for and with them, showering them with his love and showing them God’s Way. We, too, often feel vulnerable when we are called from our comfortable existence to bring the outsiders “inside”; inside to the warmth of God’s love. But we do it…through a meal, a quilt, a shower, by extending a helping hand, a smile, a conversation. So, even though LOVE is the word of the day, it really is the word of the week, the month, the year…of a lifetime, because we are given the gift of God’s love to share generously in the world. Listen to the Gospel and sermon by clicking the link below.